Choose from a large selection of hair extensions, hair straighteners and other hair products. 7 Clip Set, 18 Inch Long, 100% Human Hair. We welcome this new year with the most innovated way on hair extensions brought to you by SHE from Beyond The Beauty. The Great advantage with Flip-In Hair is that unlike traditional extensions systems. It is fine to use with thinning hair or damaged hair and is made from 100% Remy Human Hair. Our track hair extensions are 100% human hair. The hair is attached to a single weft. 100 grams. 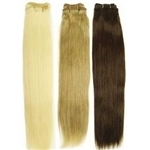 100 Grams Affordable clip in Remy Human Hair Extensions. Grade AAA. Enjoy long, healthy looking hair with easy to apply clip in extensions that add instant volume, length, and color to your hair. High quality hair and clips that stay securely in place during any activity you engage in. Undetectable Hair extensions that look and feel like your own natural hair. We welcome this new year with the most innovated way on hair extensions brought to you by SHE from Beyond The Beauty. The Great advantage with Flip-In Hair is that unlike traditional extensions systems. It is fine to use with thinning hair or damaged hair and is made from 100% Remy Human Hair. 120 Grams. Affordable clip in Remy Human Hair Extensions. Enjoy long, healthy looking hair with easy to apply clip in extensions that add instant volume, length, and color to your hair. High quality hair and clips that stay securely in place during any activity you engage in. Undetectable Hair extensions that look and feel like your own natural hair. 120 Grams. Affordable clip in 100% Human Hair Extensions. Enjoy long, healthy looking hair with easy to apply clip in extensions that add instant volume, length, and color to your hair. High quality hair and clips that stay securely in place during any activity you engage in. Undetectable Hair extensions that look and feel like your own natural hair. Choose your color and your ready to go. Shipping usually takes around 3-7 business days. 120 Grams. Affordable clip in Remy Human Hair Extensions. Enjoy long, healthy looking hair with easy to apply clip in extensions that add instant volume, length, and color to your hair. High quality hair and clips that stay securely in place during any activity you engage in. Undetectable Hair extensions that look and feel like your own natural hair. 160 Grams. Affordable clip in Remy Human Hair Extensions. Enjoy long, healthy looking hair with easy to apply clip in extensions that add instant volume, length, and color to your hair. High quality hair and clips that stay securely in place during any activity you engage in. Undetectable Hair extensions that look and feel like your own natural hair. 160 Grams. Affordable clip in 26" Remy Human Hair Extensions. Grade AAA. Enjoy long, healthy looking hair with easy to apply clip in extensions that add instant volume, length, and color to your hair. High quality hair and clips that stay securely in place during any activity you engage in. Undetectable Hair extensions that look and feel like your own natural hair. Beyond The Beauty Hair Extension 16" Beyond The Beauty Hair Extension 18"
Instantly enhances the length and volume of your hair. Comes in 7 clip in pieces for maximum coverage and comfort. Hassle free and easy to use, grabs onto your hair firmly without tugging and pulling your hair, which makes it very comfortable. Our human hair extensions can be dyed, straightened, curled, or cut just like your natural hair! Plus they are easy to wash! Remy hair extensions is the most popular type of extension, each batch comes from a single person which insures a natural and uniform look. Its the silkiest and most fashionable hair out there. Beyond The Beauty Hair Extension 20" Beyond The Beauty Hair Extension 22"
Our human hair extensions can be dyed, straightened, or curled just like your natural hair! Plus they are easy to wash!